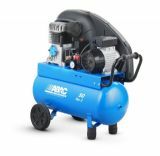 ABAC PRO single stage piston compressors combine high user comfort with great durability and efficient performance. All the units are equipped with the ABAC belt guard providing an optimal air flow over the pump. The pumps run at low speed and come with aftercoolers to reduce operating temperatures more than ever before.